Color. 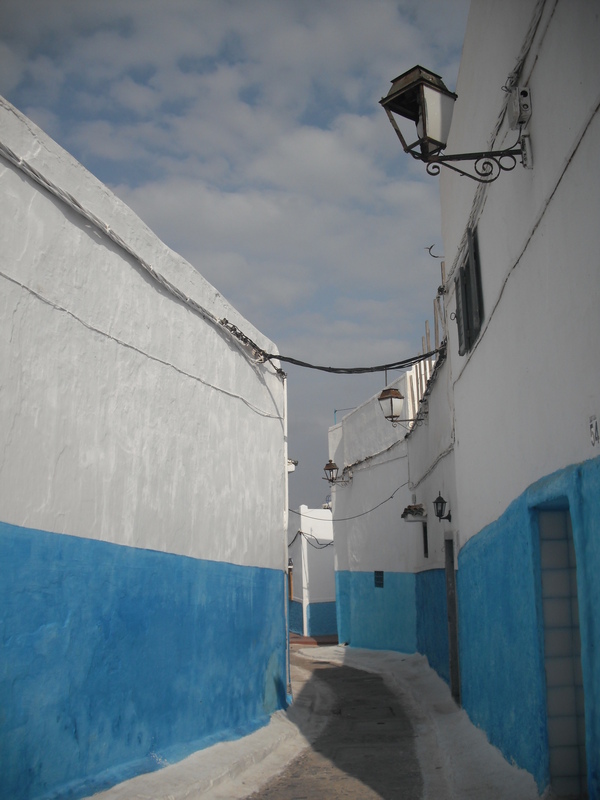 Yellow color of the walls, blue – of houses in Medina. White, in the sun sometimes blinding, – of mosques. Modest brown and mournful black – of older people dress. Bright and tempting pink and violet – of young. Incredible and numerous colors of bazaars, of mosaics that’ve been here for centuries. Palitra of colors – this is Moroccan painting. An artist from Rue des Consules (where the craftmarket is) draw it and sells to us in his gallery. His small shop belongs to a cat family. 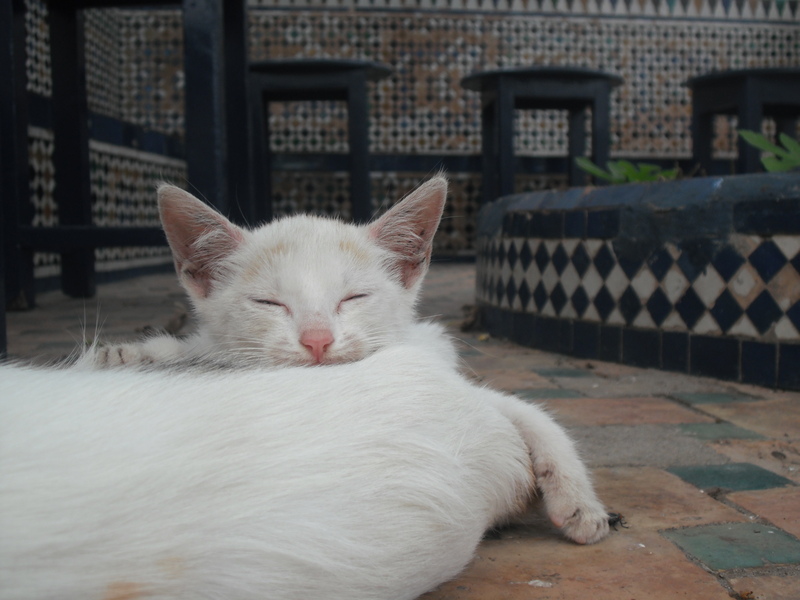 Actually, all Morocco belongs to cats. It’s the biggest and the most desperate clun. Its members are everywhere: hiding fearfully under cars, messy and dirty, wandering between tables in street cafes, examining pedestrians from windows and roofs. An another Moroccan “tribe” looks happier – street artists sing on streets of the ancient fortress-town Kasbah des Oudaias, which walls face the ocean. They play traditional instruments and entertain people, spinning the long brush on their heavy round hats. Local busketers look like those in Paris, Moscow, Koln, Cape town and all over the world: cheerful, relaxed, talkative. 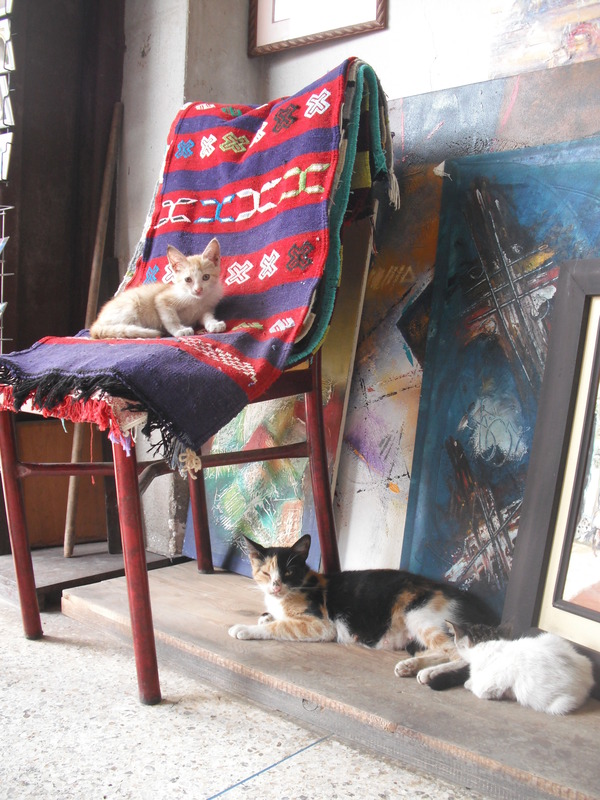 And sharing: their art, good mood and happiness. Simple and beautiful. 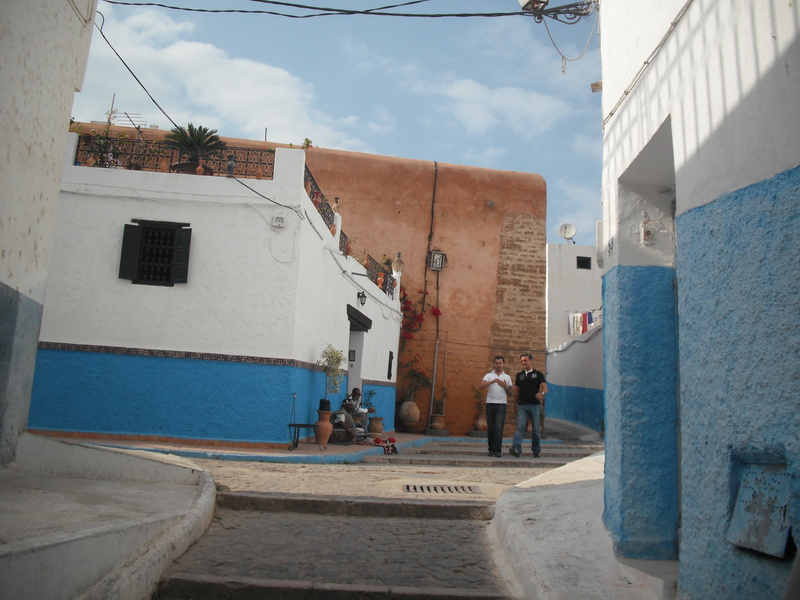 The gate Bab Chellah – a magic access to the old town Medina. If we turn to the left, we would find ourselves in the mess of Chinese market, run by Arabs and spread for not less than a mile. 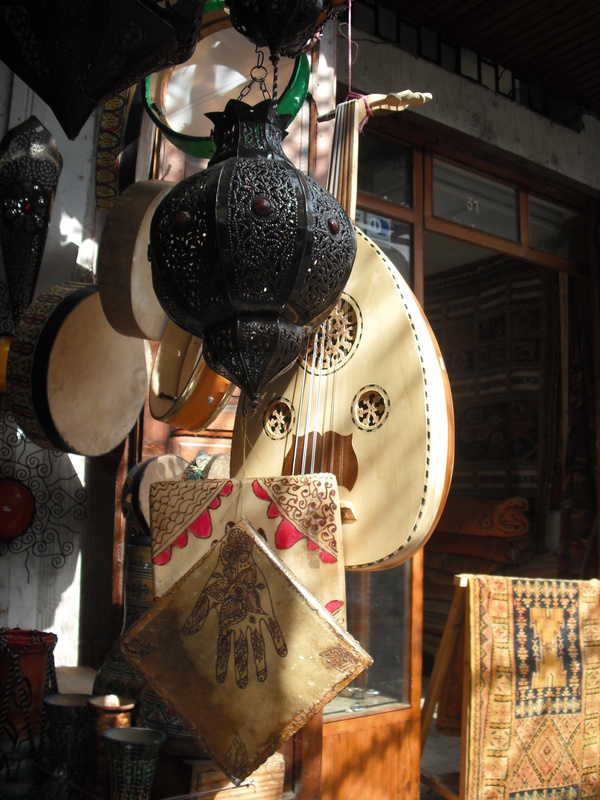 If we turn to the right, we would enjoy traditional craft of Morocco, whatever your soul desires, from brasses, carpets and Oriental caftans to musical instruments, lanterns and pottery. Make your choice, take your time. Venders kindly greet and offer their goods. Venders know what is hospitality very well here. Real hospitality, with a genuine smile and welcome. I met hospitality from everyone except guards of Palais Royal. I was politely expropriated from all three gates I tried to enter. 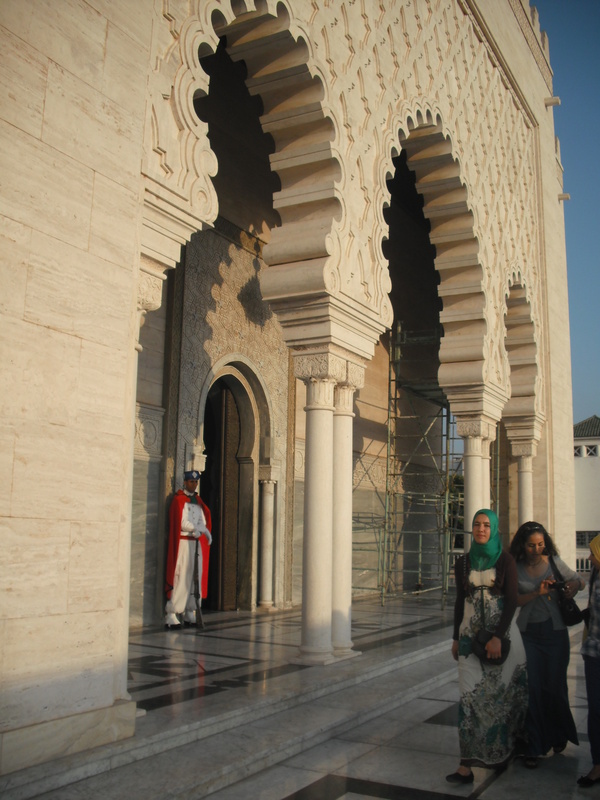 Later Kamil – my volunteer guide and new friend in Rabat, whom I met on a street, – explained me that only Moroccans have right to enter the palace. The amount of national flags – red canvas with a star in the middle – near it made me suggest it’s still a residence –not a king, but a president nowadays. 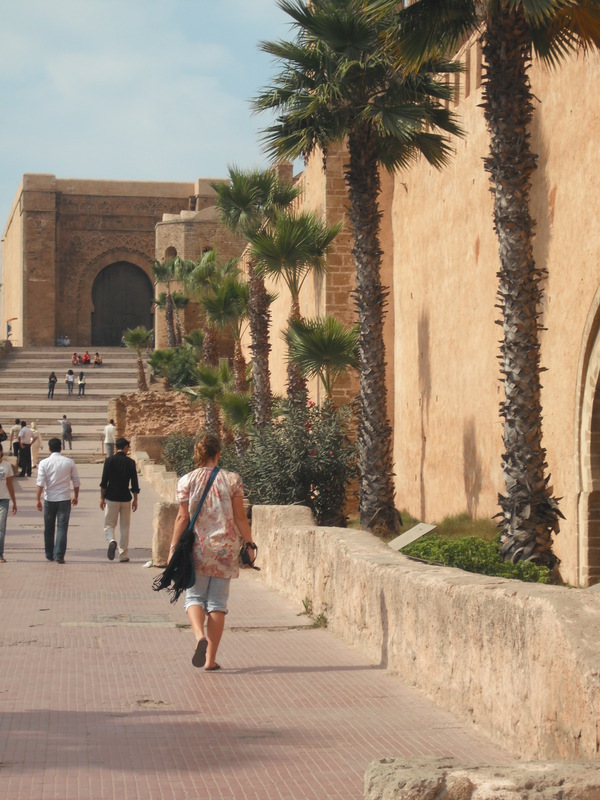 Kasbah des Oudaias is a fortress of ancient times, infused by artistic spirit of times contemporary. Not only musicians and cats feel themselves at home here. Tourists stare on beautifully decorated doors and walls, painted in bright colors. 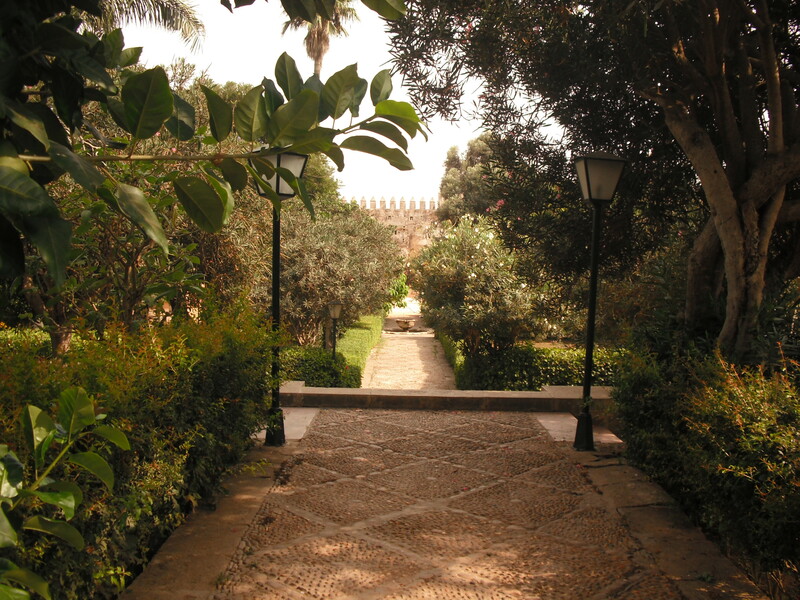 Shadow of exotic gardens – pride of Rabat. In the narrow passage of the fortress my arm was caught by a woman. She wanted to make me… an injection. In fear I ran away: I thought she will inject me a drug. That was just henna, that is used to paint on surface of hands. 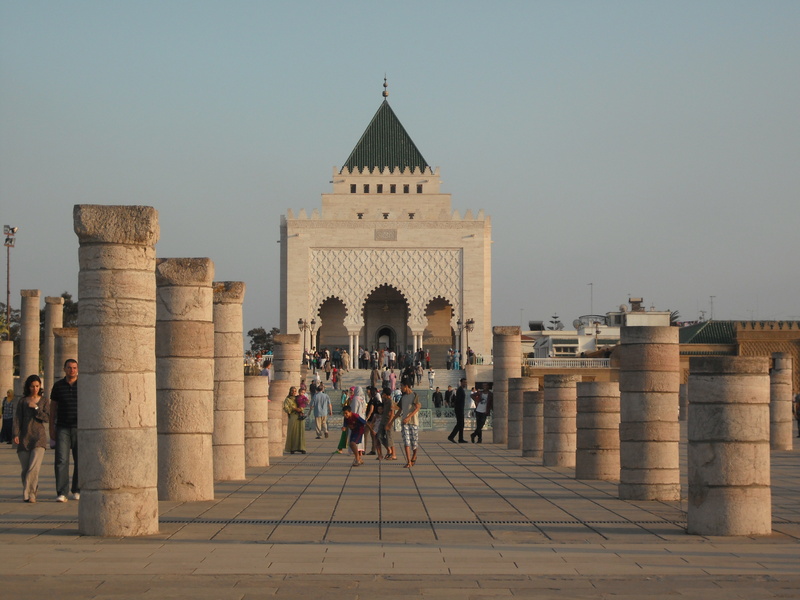 Hm… and another disappointment: cards that we bought on market for 10 Dh (about 90 cents) in the fortress cost 2 Dh… To be a customer in Morocco is a skill that demands knowledge and character. You won’t be “robbed” by vendors – but being self-confident and eloquent can save 50% of price. It’s a game – not for victory tho, but for pleasure. And some profit could be. For 100 Dh we bought spices and mint tea – traditional drink of Morocco. Now we have enough tea and spices till Brazil. 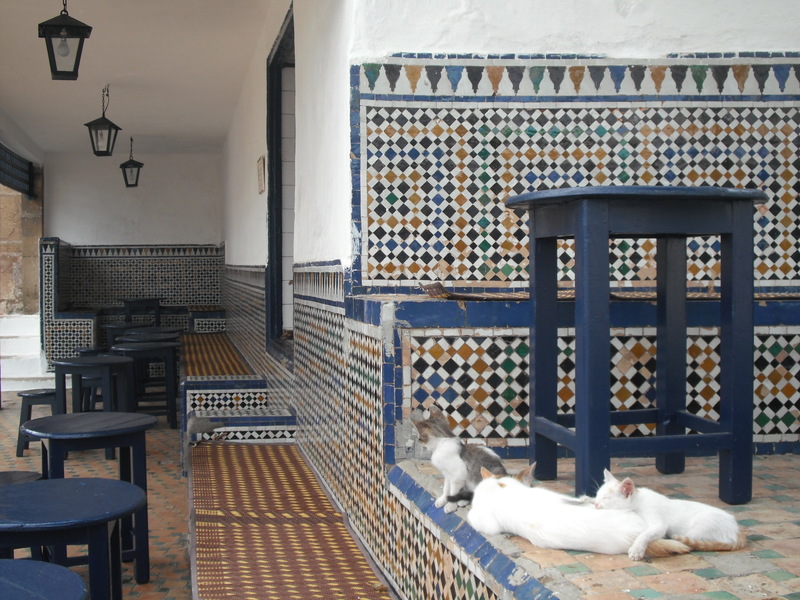 In the restaurant of Kasbah the waitor served another traditional dish – bakery. It deserved the best mark from us, sweet-eaters. 10 from 10 in the rating of “Vagabond”. We go to Casablanca. Noone of us watched the movie. We have no idea what is it famous for. We went along the coast, enjoying view of resort towns full of summer houses. Looked similar to Costa del Sol. Or Cote d’Azur. Some poor clue houses were also around. Horses and donkeys grassed nearby. Rural scenes of Marocco made me remember Namibia. We stopped on the road to buy some fruits. 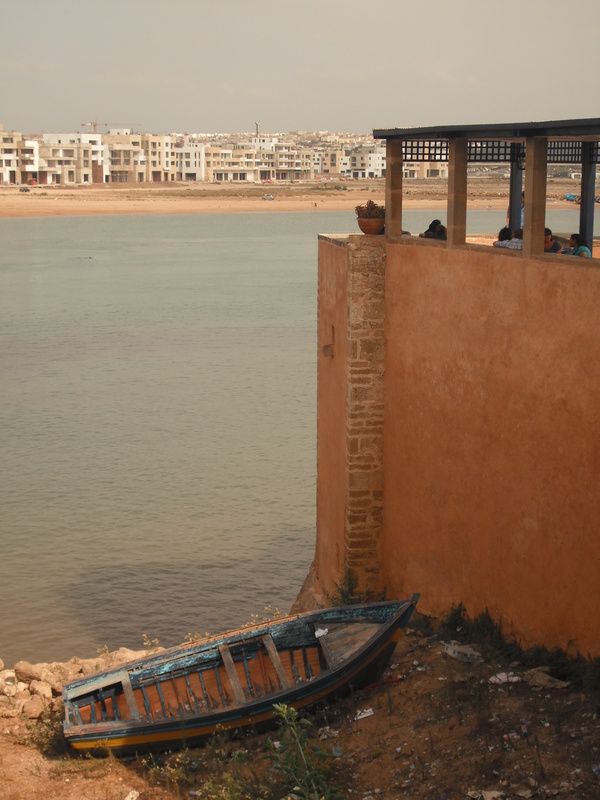 Casablanca, probably, is famous for its industrial zone. It’s huge, dirty and overpolluted. We wandered on the market of Casablanca. This time we made a brief inspection. Local market is bigger than Rabat’s. 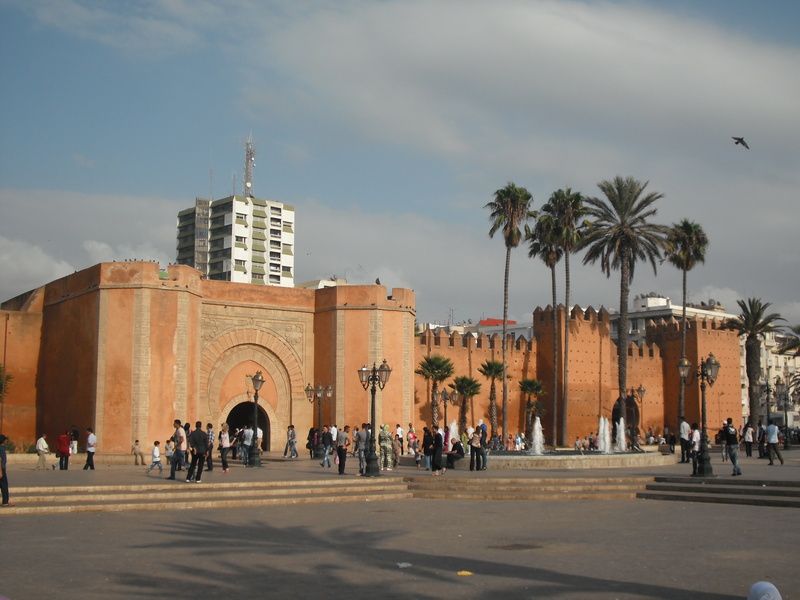 But the most famous city for shopping is Marrakesh – 150 miles from Rabat. Probably, Casablanca is also famous for traffic jams. We were lucky to get out of the city before being completely stuck. 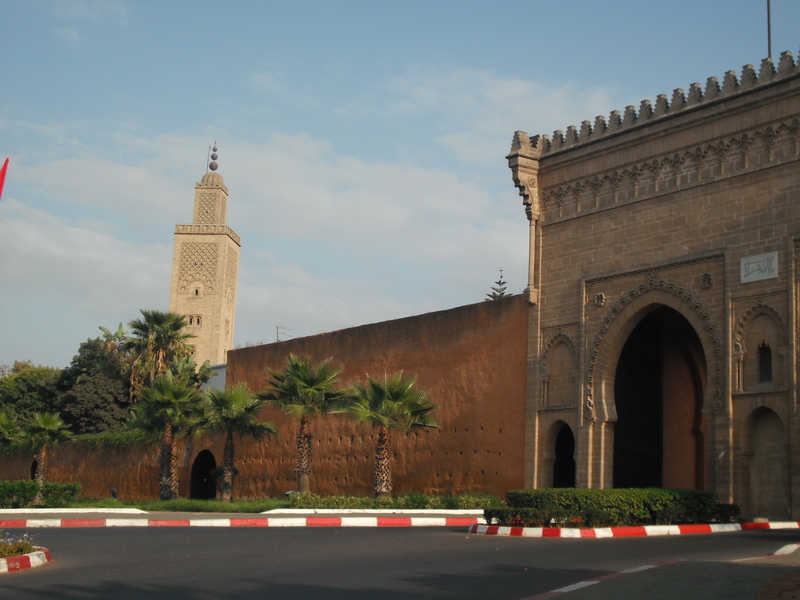 By the way, to be a driver or pedestrian in Morocco you needn’t know anything about rules. Just pray for good luck and go. Because no one cares. If the rules exist here, no one uses them. Including road police, who deserve a medal, trying to organize this mess somehow. Kabardino-Balkaria: ancient graves, greek temples, Ginggis-khan and kidnapped brides. And the palace domes' enticing space Never our freedom will replace. They say there’s nature in Rio-de-Janeiro!